#RPGaDAY2018 DAY 17: Describe the best compliment you've had gaming. DAY 17: Describe the best compliment you've had gaming. I have had some FANTASTIC experiences while playing games. 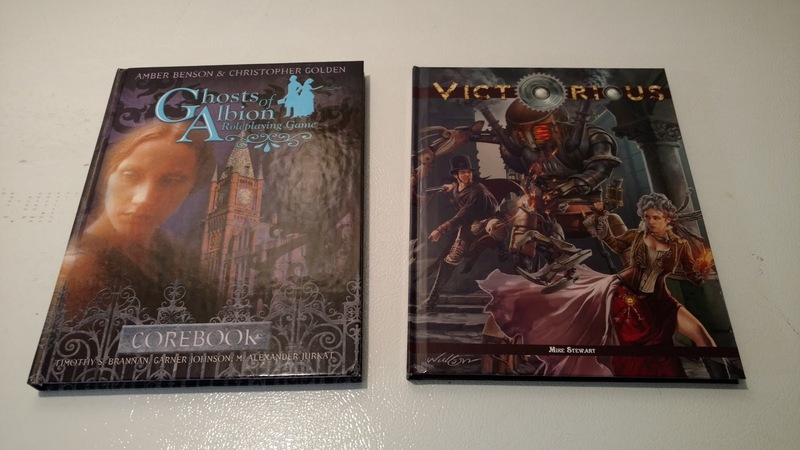 I used to run Ghosts of Albion games at Gen Con a lot. Every year I would get the same group playing my games. They told me, and others have as well, that would play ANY game I would run. I thought that was a nice compliment. These guys came from thousands of miles it was my games they enjoyed the most. Interestingly enough, after I stopped running Ghosts (to enjoy the con more with my family) I played in a Buffy/Supernatural game. The same guys were that too. In that game, I got praise from the GM for playing the best Piper she ever had. #RPGaDAY2018 DAY 14: Describe a failure that became amazing! Day 14, We are at the two-week mark! Today is day 14 and the question is Describe a failure that became amazing! Hmm. That's a cool question really. We have all had failures and some of mine have been spectacular failures! One of mine was this old combat simulator we were working on for the Tandy Color Computer in BASIC. The first big run a black dragon attacked my ninja, basically pulping him in the first attack and then spending the next 400 hp of damage in attacks on my poor dead ninja! It was quite amusing to watch. Another great failure was the first magic system of Ghosts of Albion. I had been challenged with improving on the already great magic system from the Buffy game. Version 1.0 was not it. Version 1.0 had some additional rolls and other effects but it was all noise. More to the point in the playing these extra fiddly bits slowed down play to a breaking point. My playtesters were gleeful. But, I did tell them to break it, and they did. I went home with the tattered bits of my game and my pride and sat in front of my monitor, clueless about what to do next. When it hit me it was like lightning! I trimmed it down and made it faster. And now the magic system is the jewel in the crown of Ghosts! Time once again for another chapter of Plays Well With Others. Between some games there are often rivalries, heated debates, or even outright distaste. Some games even have that between editions. Not so for Victorian-era games. We, the aficionados of such pastimes, fancy ourselves more genteel Lords and Ladies. We generally get along and support each other and celebrate each other's successes. This can be seen in the Facebook groups Victorian Gamers Association and +Jordan Bodewell's Victorian Adventure Enthusiast. 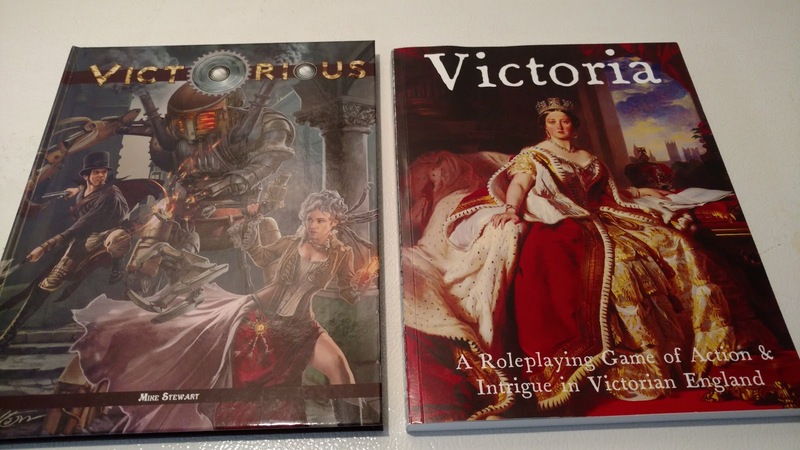 So today it will my pleasure to discuss how you can use Victorious with various other Victorian-era RPGS. Note and Disclaimers: 1. I am making no attempt whatsoever to hide my biases here. 2. All books are mine. No book was provided for review purposes. 3. Links are affiliate links. 4. This will not be exhaustive. Tho star with let's talk about what Victorious brings to the table that is unique. This is not just a Steampunk game or a game of Victorian daring-do. This is a game of Super-humanity from a Victorian point of view. This is the writing of Friedrich Nietzsche writ-large with more hope, action, and steam. These are the promises of the ideas, but not the letter of, Charles Darwin. The attitude is generally positive (which mind you can be a criticism of the game, the Victorian times were dirty, poor and generally terrible for many). Victorious, true to it's name, is about striving for more and then seeing that goal realized. If you go back to my review from yesterday you will see right off the cuff there are a few things that can easily be added to any Victorian game from Victorious. 2. Background on the Victorian world, with various organizations. 3. The NPCs, in particular, the villains. Many of the games I am talking about will also have these, but using them in concert makes for a better game. Right off the bat Victorious has a LOT in common with Leagues of Adventure. Both games have similar motives and design goals. Where Victorious can be summed up, though inadequately, as "Victorian Superheroes", Leagues of Adventure is summed up as "Victorian High Adventure". Both have simlar Pre-Pulp sensibilities, and both have the point of view of Mankind will soon be much better. I think the main difference to me is summed up by think how the characters could travel from London to New York in each game. In Victorious the character would either fly by some sort of super-human means (in addition to other means) in LoA the characters would pilot a steam powered airship. The timelines of both games are largely compatible and characters in one would feel right at home in the other game. Could you imagine a team up of these characters? I totally can. The power levels of LoA are a little flatter than Victorious'. Character start out and remain largely human-powered. LoA has more skills, but Victorious' rules are a little faster on how skills are dealt with. The GM of one game should find a lot material in the other game to give them plenty of ideas. If Victorious is about super-humanity, then Victoriana is about weird-humanity and others. Regardless of which edition you have/buy (1st Edition is pictured below), Victoriana is a little further on the "Castle Falkenstein" scale of Fantasy Victoriana than Victorious is. It also takes place in the mid-Victorian era compared to Victorious' ever-popular late-Victorian era. 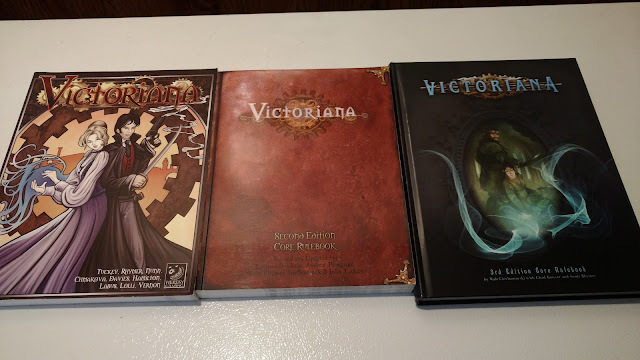 Victoriana is often described as Gaslight-Shadowrun. This is true. There are also plenty of other races like orcs, trolls, ogres, gnomes, elves (Eldren) and dwarves running around. Victoriana is a fun game, but I sometimes wonder what it would be like under a different rule system. Well not exactly like that...but you could fake a really cool Victoriana by mixing Victorious with Castles & Crusades. It would be a system that most of my readers would already be familiar with and still get at some similar types of game-play. 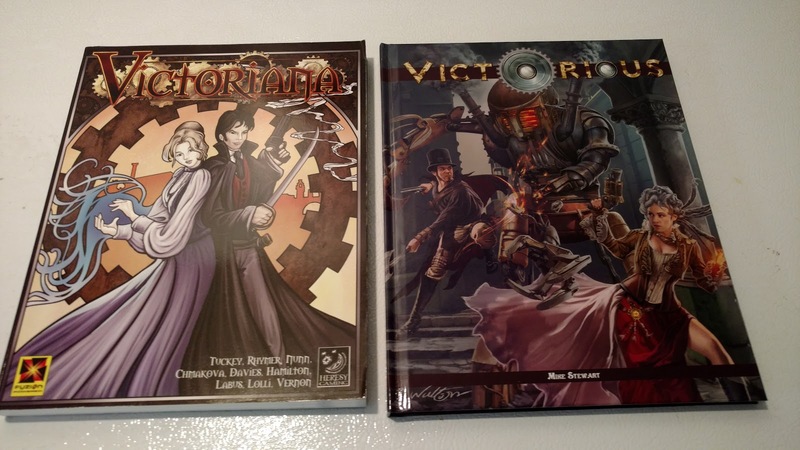 I would then advise GMs to grab some of the 3rd Edition Victoriana supplements. Most of them are written with a minimum of game stats and all are absolutely beautiful. 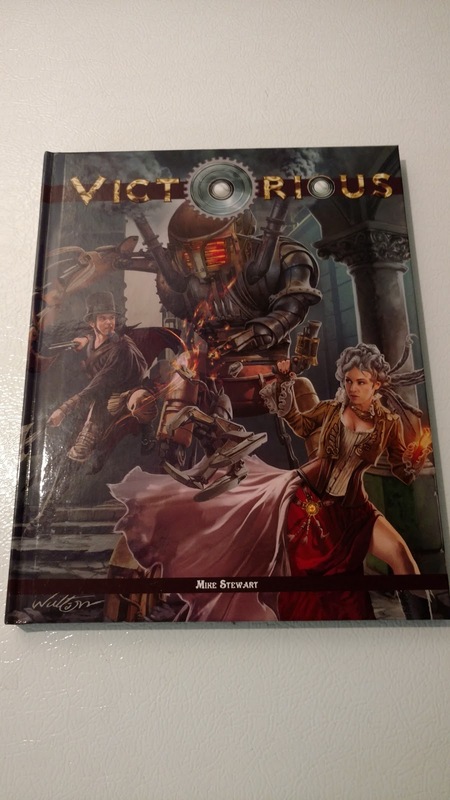 While reading over Victorious I could not help but think of this picture from 1st Edition Victoriana. This appendix in Victoriana covers very well what mixing 21st-century super-heroes with 19th-century sensibilities would be like. It is a good read for anyone running a Victorious game. In our hypothetical trip from London to New York, our Victoriana characters also travel by Airship, though it is not steam powered, but rather some eldritch magic. Or they find an ancient Eldren gate. On the WAAAY other end of the "Castle Falkenstein Scale" is +Daniel Hodges' Victoria. Victoria is very much set in the "real world". It is, however, a game I always suggest since it deals with the issues of the Victorian times better than pretty much every other game. Why? Because those issues are the focus of the game. IF as a GM you really want to get a feel of the times then this is the game to use. In fact, I have often wanted to run this game as an introduction game. Everything is nice (well...not really nice) and normal then move on to the Fantastic game of choice once the characters learn of the "true world". To travel to New York from London in this game you better book passage on a steamer and with some luck you will get there in about a week. We have now used up all versions of "Victoria" for a game! 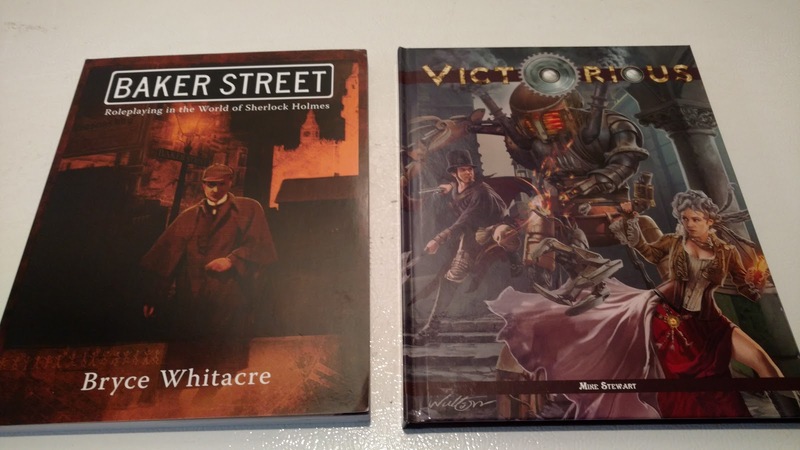 On the same scale as Victoria is the Sherlock Holmes influenced Baker Street by +Bryce Whitacre. Baker Street is set in "normal" Victorian times, albeit, one with Sherlock Holmes as a real person. Victorious also has the world's most famous detective. GMs should pick up a copy of Baker Street if Sherlock is going to play any part in their Victorious game. Plus the clue-resolution system in Baker Street is fantastic and is something that can be lifted out to use in any game. I will go as far as to say that Baker Street is one of those underrated games that should really get much more attention and many more awards. Again. Steamer ship, arrive one week later. Let's go to the other side of the scale into more Horror. It is October after all. 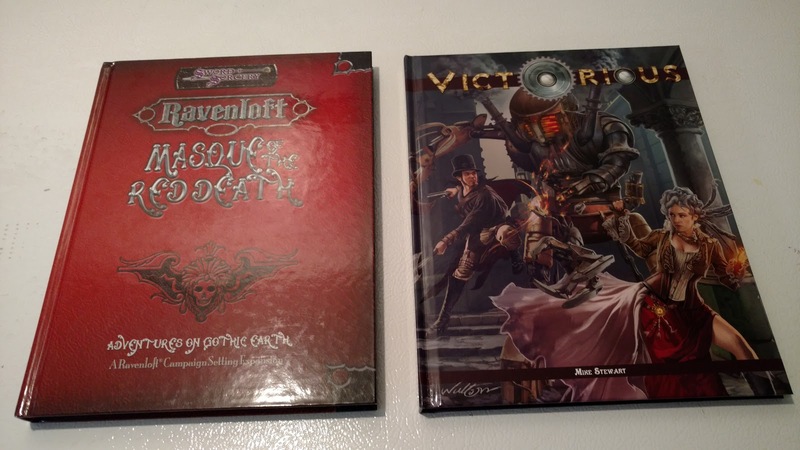 Ravenloft Masque of the Red Death shares a lot of DNA with Victorious. Either the d20/3rd edition or the original 2nd edition would work fine here. 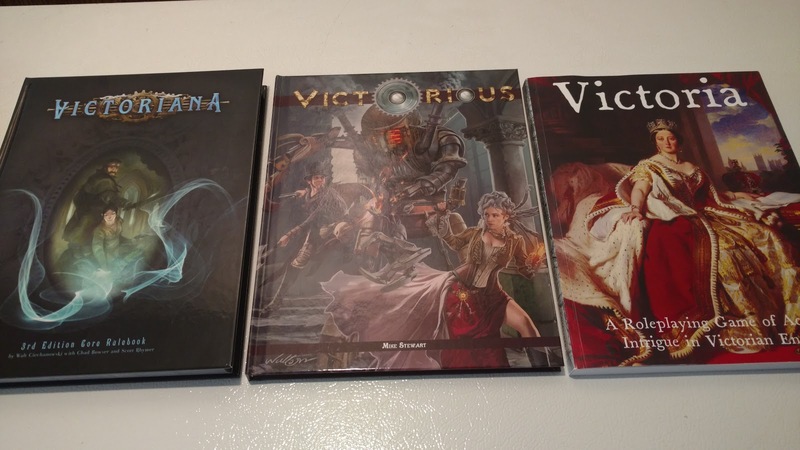 I have already mentioned that you can mix Victorious with Tainted Lands and get something not unakin to Ravenloft Masque of the Red Death. Both games have several compliments to each other. Both have great and well-researched timelines. Both games have a great variety of NPCs and Villians. In fact, most of the material from one game can be used with the other with little fuss. The big issues though are what does the Red Death mean in Victorious and how do super-humans work in Masque of the Red Death. If you want to add some Gothic Horror to Victorious this is where I would start. I for one would pick up MotRD's A Guide to Transylvania in a heartbeat to use with this. Not too far away from Masque of the Red Death, but further up on the CF scale (this is a thing now) is Gaslight. Gaslight is cut from the same cloth as Masque. Since it is OGL/d20 it mixes with Victorious well. I would argue that the system in Victorious/Castles & Crusades is better than d20 for this, but use some ideas from Gaslight to add a little more horror to your game. In truth, Victorious and Ghosts of Albion are very, very different games. Victorious takes place in the late Victorian era, Ghosts in the early. There are plenty of known superhuman and supernatural occurrences in Victorious. In Ghosts everything is hidden behind a veil of secrecy and magic. But both games have a number of complimentary features. First, if you plan to run one game in the other's time frame then both have good, detailed timelines. Magic is a main feature of Ghosts, so if you are planning to add some more magical juice to Victorious then this is a good place to start. I bet I could put together a "Protector" class for Victorious. Mix in some details from Amazing Adventures and I could have a Ghost, Faerie and Vampire races for it as well. Otherwise, the Magic quality is easily replicated by Victorious' Magicians. 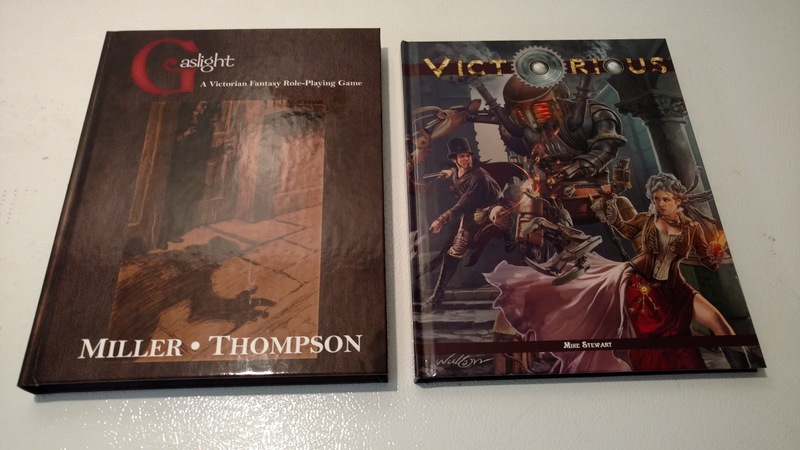 One day I'll run an ultimate Victorian game with elements of these games plus Space: 1889 and Cthulhu by Gaslight. Something truly epic. I have been blogging here for a while. Mostly about D&D and related clones, but some other games too. I was reading over some rule books for games I have not played yet or haven't played in a long while and I was thinking. I really miss the modern supernatural genre. I have lost track of all the games I have played over the years since the early days of Chill and Call of Cthulhu. I have lost track of all the books I have read in this genre as well; has to be in the hundreds by now. But I also enjoy the over the top heroics of D&D and supers games too. 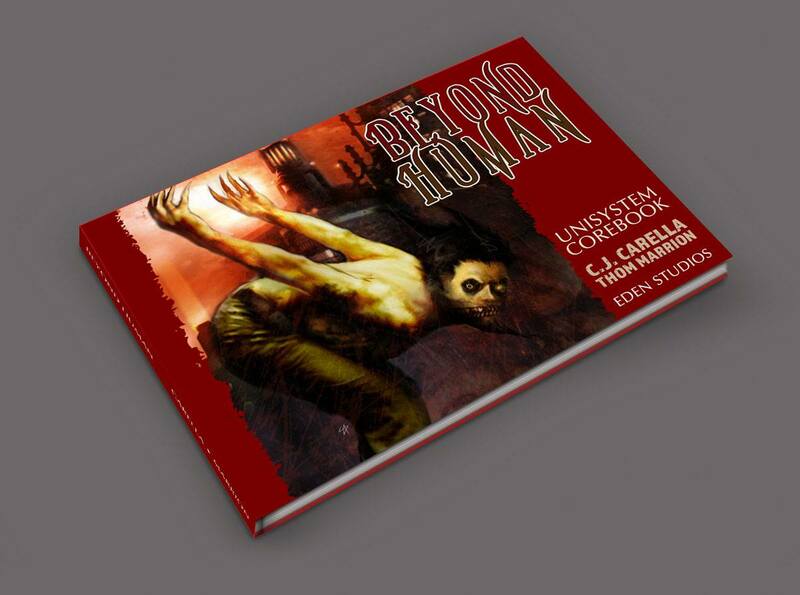 So imagine my surprise when I saw Eden Studios was finally publishing the long, long, long, awaited Beyond Human. Years, a life time ago it seems, I helped with this book. I contributed quite a bit to the magic chapter. The magic system is based on my Ghosts of Albion game, which is based in turn on C.J. Carella's own magic systems in Buffy the Vampire Slayer (another game I worked on) and on the WitchCraft game. I really would love to get something new for these games going again. Ideas are plentiful, time really isn't. One day I'll return to this world. I am going to running a game of Ghosts of Albion: Dinosauria! at ValorCon this Saturday at 10:00am. Here is the blurb from the program. You are cordially invited to a special and most unique diner party. You will be the guests of Richard Owen as he unveils the most exciting scientific discovery of our time. You will behold Owen's incredible Dinosauria! Dinosauria is an introductory adventure for the Ghosts of Albion Role-Playing Game. 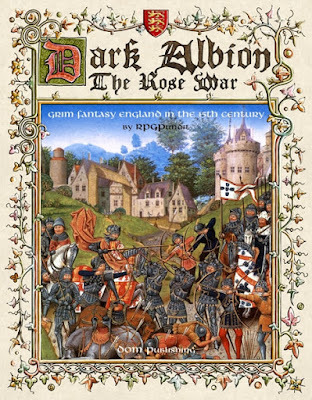 Take on the role of power mages, ghosts, vampires or humans that hunt the darkness to protect the shores of England in the early Victorian Age. Ghosts of Albion is powered by the fast and easy to learn Cinematic Unisystem game engine. The same system found in Buffy the Vampire Slayer, Angel and Army of Darkness. No knowledge of the game needed. Game Master provides character sheets, dice and rule book. 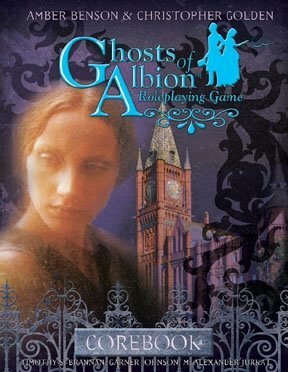 So if you are in Chicago come on by and sit in on a game of Ghosts of Albion! Kind of a no brainer really. The perfect game for me is the one I wrote. Again it is everything I have ever wanted in a horror game, everything I want in a fantasy game and one I can run with zero prep time. It's a period I love, with rules I love and characters I adore. What else could be more perfect? Ah. This now like choose amongst my children. I love Horror RPGs, more so than fantasy or supers really. There are a lot of great choices Chill, WitchCraft, Call of Cthulhu, Vampire, Mage...so many. But if I am going to have to choose then I choose...myself! Not to be to blunt, but it is everything I have ever wanted in a horror game. I poured blood, sweat and tears into this game. But that means nothing to Joe or Jane Player out there. It is also a fun game, with a great setting, some great monsters and, in my opinion, one of the best magic rules I have ever used. If I never publish another game or book I will be content because I wrote this one. The print version with ribbon. I don't think there are many of these left. Time for another edition of Plays Well With Others! What got me at the time is a.) how much I liked it and b.) how much I didn't want to play it under D&D (any version). 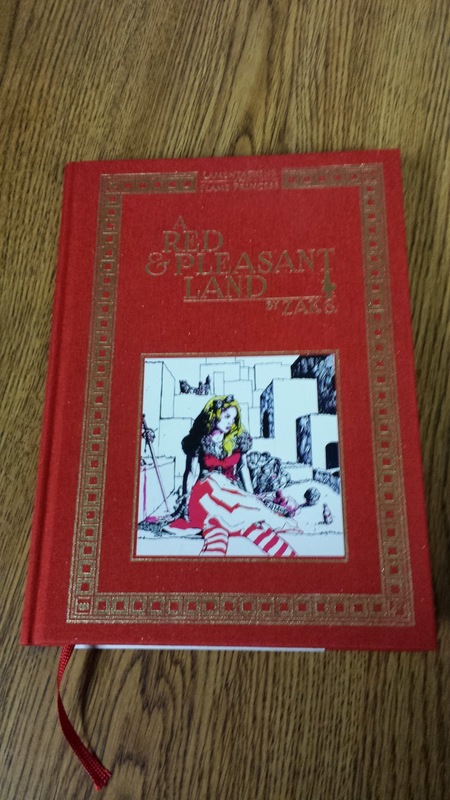 I started thinking about Alice, Dracula and this book I thought that what this book really needs is not a background of fantasy, even the Grimdark of LotFP or DCC, but the prim and proper sensibilities of a more refined time. Victorian England. Think about it. I described the country, Voivodja, in AR&PL as Nightmare scape. Not an overt one like say the Hells, but a subtle one, and mostly a chaotic one. What a better contrast to the streets of fog soaked Victorian London? After all Voivodja isn't in our world, it's out there somewhere; down a rabbit hole or through the looking glass. Through a looking glass darkly. OR if it is, maybe it is an odd mirror. Page 14 of AR&PL will give you ideas. The difference now is that we are all using the same world. Unless your D&D game is set in Europe of course, then you are ahead. There are a lot of great choices for games to use this with and each offers something special I think. 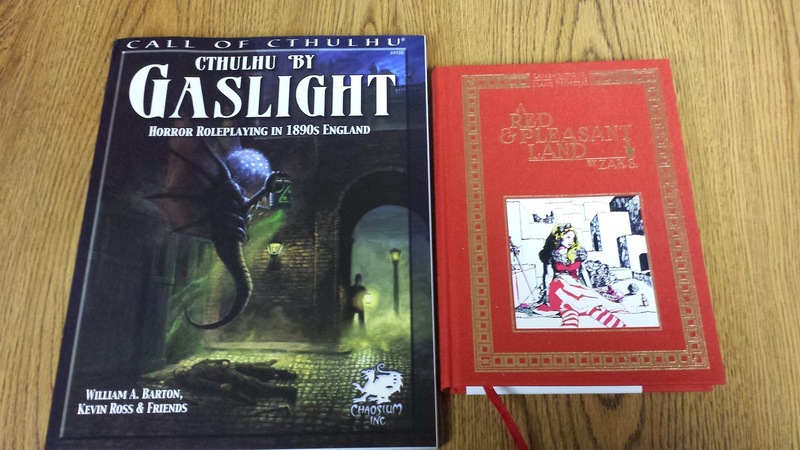 Cthuhlu by Gaslight is one of the best Victorian era magical games out there. CbG has rules, via Call of Cthuhlu, for dealing with the Dreamlands. This is a good way to get characters from the "real world" to Voivodja. Now Voivodja could be in our Carpathian Mountains or they could be in the analogue in the Dream lands. Who knows. One thing I would suggest is get a good grip on the Sanity rules and how to apply them using AR&PL. There are things here that could be abused and drive the characters completely insane. I say use them sparingly; instead focus on the weirdness of it all. Not the mind bend weirdness typically one associates with the mythos. Translations of monsters would not be hard. Though the average CoC/CbG game is more about investigation. There is more doing in AR&PL, even if that doing isn't always combat. Though they both have that in common. I think there are plenty of good reasons to use Ghosts of Albion. First the there is more expectation that characters will do more in GoA than in CoC. Again monsters are easy to convert; most are in the Ghosts core book or could be found in any of the Buffy books. Secondly let's address the elephant in the room. Zak may not have meant Alice to come off as an ersatz Slayer, but she kind of is. 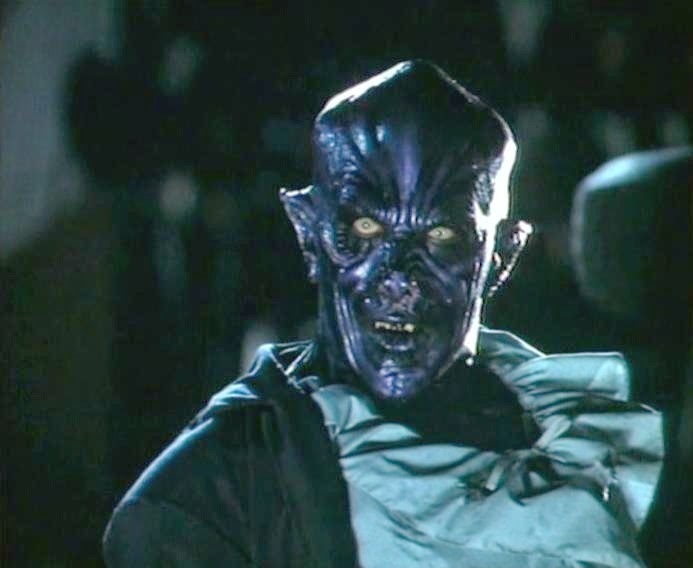 Or rather the Alice is the trope that the "Buffy" is trying to set up. All I am saying is that thematically they work well together or even as each other. Alices are not Protectors, but they can be weaker Slayers or Chosen Ones (Army of Darkness) in any case the rules in GoA have it covered. Alice's would get extra Drama Points (I would say 2 extra at starting). The leveling up table would be used for every 25 XP gained. Just allow her to take the appropriate Supernatural Qualities. The Alice would be a 5-Point Supernatural Quality. I'd have to work out what is in it, likely bonuses to Charisma, Hard to Kill, but some drawbacks too. Nothing major and nothing more than 5 points. The more magic-rich world of Ghosts works well for AR&PL too. And between Ghosts' Supernatural rules, Angel's demon rules and Buffy's vampires you could make every type of vampire in the book and then some. This of course might the best fit. 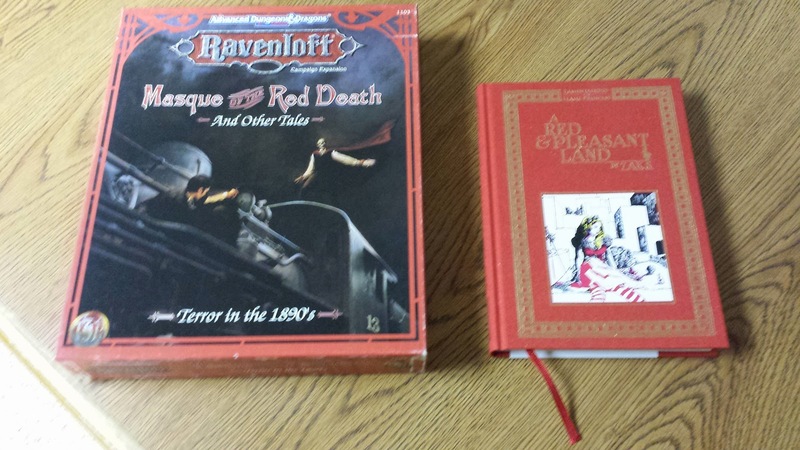 Ravenloft, Masque of the Red Death is set on Earth in the Victorian era. It uses the same D&D system as AR&PL. Plus a lot of the changes that LotFP made to D&D can also be found in this book. Specialists are called Tradesmen in MotRD. While the other two can be "easily converted" this one does not have to be converted at all. You can even use the Alice as is. Plus a lot of the strangeness in AR&PL can be explained by the power known as The Red Death. I would opt for the 2nd Edition version pictured here as opposed to the 3.x update from Arthaus/SSS/White Wolf. In fact going back through my Masque books I think this might be the one I would use for this. You could travel the Orient Express and end up in A Red & Pleasant Land. In any of the above cases I am much more excited to run this than under D&D or a clone. For D let's travel to Ireland for the nasty Dearg-Due. Also know as the Dearg-dul or "Red Blood Sucker" these are particularly nasty little beasts. Presenting them here for use with the Buffy the Vampire Slayer RPG or the Ghosts of Albion RPG. These ghoulish vampire sub-types were found in Ireland and parts of Great Britain before their Christian conversion. During that time, all Dearg-duls were wiped out. Some Church historians claims these are “snakes” that St. Patrick drove from Ireland’s shores. In any case, no one has seen one in nearly 1,000 years. Until today that is (aren’t you the luck one). Dearg-dues are basically animalistic predators. They are not intelligent, but may be controlled to a slight degree by a sufficiently powerful sorcerer (Magic/Sorcery 4+). They hunt in packs of three or more. The creatures prefer the taste of fresh blood like all vampires, but they are not above raiding a tomb for food. Their eyes glow amber-red and they look like ragged, blue tinged corpses. For the most part, Dearg-dues have the same powers and vulnerabilities as your garden variety vampires. What sets these little nasties off is that a stake to the heart (sufficient to drop them below zero Life Points) does not kill them. It stops them, but they don’t turn to dust. Their only goal at that point is to reach out feebly and remove the stake. Once that is done, they recover normally (normally for a vampires, that is) and come back for more. The only way to kill them permanently is by piling stones on top of them. Once every part of their body is covered, they are destroyed. Dearg-dues can’t effectively make more of their own kind, but once in a while (1 on a d10) a victim drained by a Dearg-due will rise as one. I could tell by her voice that she was of regal bearing and intelligence, but at first I could not see her. I was looking out over a darkend grey and cold plain. In the far distance I saw mountains; mountains I know I had never beheld before with mortal eyes yet no less real. In the sky above flew beasts, for that was the only world for them. They appeared as mad paintings of Hieronymus Bosch, a mass of flying, winged semi-human creatures. Their appearance was as women, save shamefully unclothed, though it was difficult to see this from the filth that covered them. The smell was worse than any charnel house I could recall; the decay of death, the reek of excrement and the sour odour of unwashed sweaty bodies. Their hair was wild. Their teeth were long, yellowed and many were broken. This is how I knew I was still in the dream. Such details would have escaped me given their distance. In truth, I wanted to be no closer to these hideous creatures. Their eyes burned red like coals of hellfire. I watched as they flew and they attacked and ate other beasts in sky. They were aware of me and my companion, but made no move towards us. "What are they?" I asked and I turned to meet my unseen companion. To my shock she appeared as they did, save she was not a filthy degenerate creature, but a woman of regal bearing. 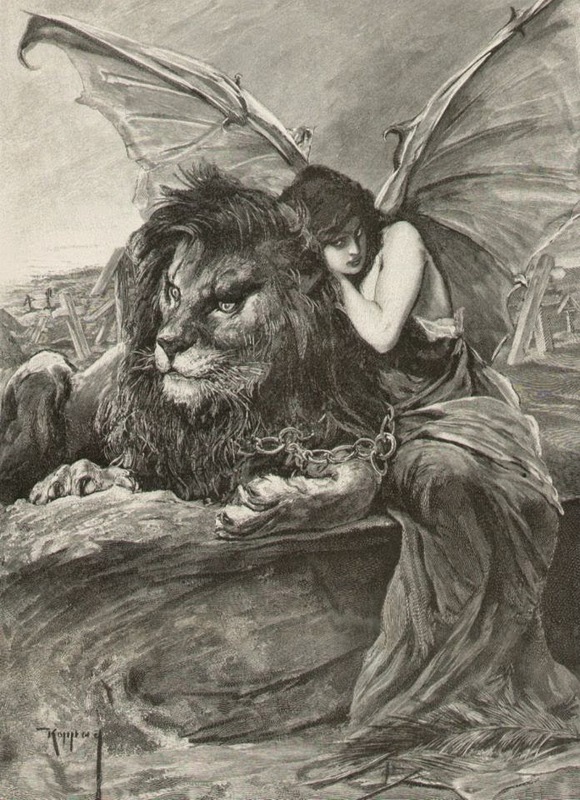 She had the same clawed hands, the same large bat-like wings and most horribly the same eyes. "They are Ur-hags." she had said. "They are my sisters." The Degenerate Ur-hag appears to be a hideously ugly humanoid woman. She appears naked, but covered in filth, with long clawed fingers, wild hair and inhumanly long feet and toes. 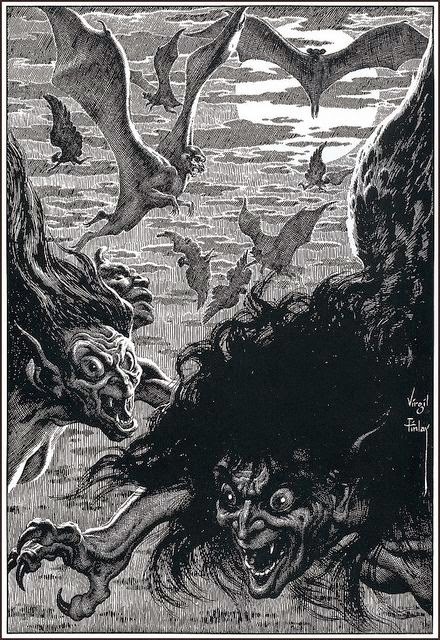 What is the most curious feature of the ur-hag are her large bat-like wings. One is immediately reminded of a harpy; which scholars also claim are an offspring of this creature. The ur-hag does not speak, but only screams and shrieks. The ur-hag can attack with a claw/claw/bite routine which is their most typical attack. They are also surrounded by a horrible stench. Characters within 10' of the Ur-hag must make a Constitution test at at least 2 Success Levels or suffer a -2 on all attacks against the creature. The ur-hag may also cast spells as a witch with Magic 2. Spells that attack and due damage are preferred over all others. Ur-hags are immune to all cold-based effects and are immune to cold and cold based spells. Dengerate ur-hags are carnivorous and their preferred source of meat is humanoid flesh. They are able to enter the dreams of people sleeping in their territories; usually within 300 yards. Through this special attack the ur-hag will Charm a sleeping male into breeding with them. Once complete the ur-hag will then wake thee male to kill and eat him. They prefer to wake their victims because they enjoy hear the sounds of their screams. Within 3 months the ur-hag will lay a leathery egg in which a juvenile ur-hag will emerge. The new ur-hag will not expect any care or succor from her mother; in fact the mother is just as likely to eat her offspring as she did her offspring's father. The Noble ur-hag is a different creature, though no less evil. Like the degenerate ur-hag, the noble appears to be a winged woman with long taloned hands and feet. Noble ur-hags also have horns growing from their heads that often causes them to be mistaken for some sort succubus or other demonic creature. While not demonic, the noble ur-hag is still quite evil. While the degenerate ur-hag is hideous and covered in filth, the noble ur-hag is regal, attractive and clothed in only the fines wares. Her features are sharp and possibly indicate a relationship to the fae that other, more common hags, share. The noble ur-hag can be harmed by iron in the same fashion that fae are; iron weapons cause +2 damage and +1 to hit. The noble ur-hags can cast spells as a witch of Magic level 4. While the degenerate ur-hag is indiscriminate about her choice of mating partners, the noble ur-hag prefers only the finest quality human males. Also noble ur-hags do not always eat the men the lay with. Some preferring to return to the same male time and time again as instinct drives them to reproduce. Noble Ur-hags use the same stats as do the Degenerate Ur-Hags save they have Attractiveness +1 and Magic 4. The Noble Ur-Hag also has the following magical manoeuvres. Additionally the Noble Ur-Hag can choose demonic or fae powers. Many posses Glamour and Grand Glamour. A Noble Ur-Hag is capable of interacting in society, however her mannerisms will seem a bit aloof and more prone to violence than that of mankind. The Degenerate Ur-Hag, even if glamoured by another, cannon interact in even the roughest society. There is no known spell to summon these creatures and they only live in the shadowy borderlands where Dream, Shadow and Faerie are known to intersect. Many of you know about the Bundle of Holding. Well the newest one features Unisystem powered games which are some of my favorites. Conspiracy X 2.0 (retail $17.50): UFO conspiracy in the post-9/11 world. As an agent of Aegis, you're our best hope against the alien threat. CJ Carella's WitchCraft (free): The magical Gifted have been persecuted for centuries. Now, join with your coven-mates to shape the modern world. WitchCraft was the first Unisystem game. Armageddon: The End Times (retail price $15): The Apocalypse has arisen, but not the way anyone predicted. Play as an angel, a demon, or a mortal brave enough to challenge a god. Ghosts of Albion (retail $5): Explore occult Victorian London in this complete RPG (widely regarded as the best version of the Cinematic Unisystem rules) inspired by the 2003 BBCi series co-created by Amber Benson. Terra Primate: Savage adventure in a world where Man is the missing link. I have gone on and on about my love for these games. Admittedly I am biased. WitchCraft might just be my most favorite game of all time. In my mind WitchCraft is the perfect game, it has everything I have ever needed in a game. Armageddon is a "sequel" to WitchCraft. It extends the myths and expands the system to include some greater supernaturals and more metaphysics. Armageddon isn't a "post apocalyptic" game, you are in the middle of the Apocalypse right now and you have a chance to send the world in a completely new direction. Conspiracy X 2,.0 updates 90s paranoia to a post 9/11 world. Written by Dave Chapman (of Doctor Who fame) it uses the same system as WC/Arm but presents a very different sort of world. Terra Primate also uses the same Classic Unisystem rules as WitchCraft, Armageddon, Con X and All Flesh Must Be Eaten. In this game though all the characters are (or can be) intelligent apes. Think Planet of the Apes. Really great and underrated game. Ghosts of Albion. What else can I say about this game? It's my baby, my magnum opus. I love that they mention that is is "widely regarded as the best version of the Cinematic Unisystem rules". If WitchCraft is my favorite game Classic Unisystem game then this is my favorite Cinematic Unisystem game. In fact I have often said that Ghosts of Albion is my love letter to WitchCraft. The bonus books are really, really awesome. Conspiracy X Paranormal Sourcebook (retail $17.50): Alien vs. ghost -- who wins? With your luck, you'll be squaring off against them both. Conspiracy X Extraterrestrials Sourcebook (retail $17.50): Planning a close encounter with alien invaders? This is the Conspiracy X sourcebook you need. Mystery Codex (retail $11.50): New WitchCraft skills, powers, metaphysics, and, above all, vampires. 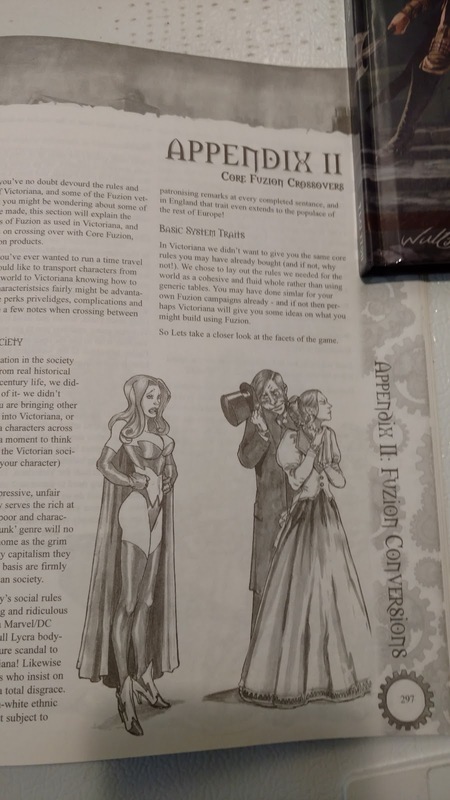 Abomination Codex (retail $8): More skills, powers, metaphysics, secret organizations, voodoo magic, and -- because the vampires weren't enough -- were-creatures. The Con X source books will work with the WitchCraft/Arm ones and visa versa. You just have to figure out how to get the myths of both worlds to interact. 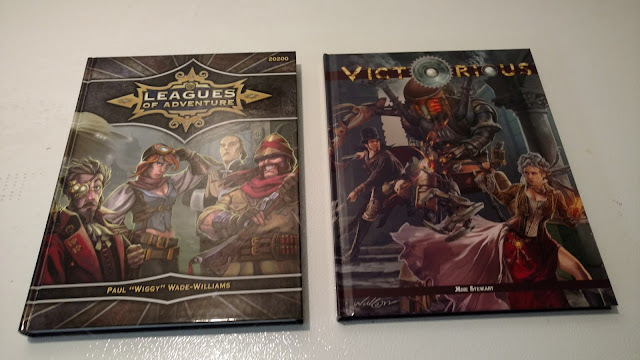 Mystery Codex and Abomination codex are also long out of print, so getting these PDFs is the only way you can get the books now. So if you don't have these books yet now is a great time to check them out. I give ALL of them my highest recommendations. Plus 10% of your contribution goes to the American Cancer Society. So there is that. 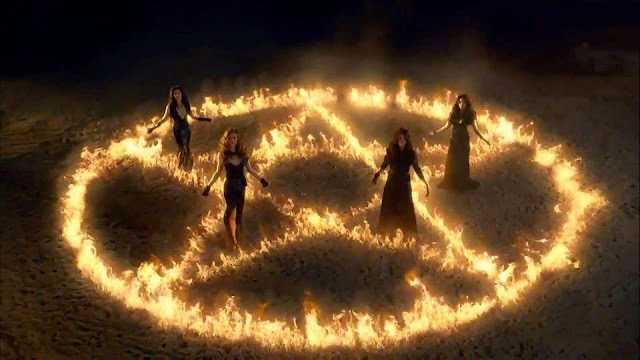 It really should be no surprise that I enjoy Lifetime's Witches of East End. Yes it is a "chick show" and yes it is soap opera-y but really I don't care. It is a a fun show and it has witches in it. Plus I love Mädchen Amick and was drawn in because of her. But a few surprising things happened. First I was not prepared to walk away saying "wow Julia Ormond was really great in that!" I NEVER liked Julia Ormond, I never liked her work. Yet this show made me do a complete 180. I think she is great in this and now I am wondering if I was just underestimating her as an actress. OR I think she needed to mature a bit more (and maybe me too) so I could appreciate how good she is. Rachel Boston and Jenna Dewan-Tatum are both great as the younger witches Ingrid and Freya respectively. Honestly it is like the a crossover between "Charmed" and "Practical Magic". Of course I was bummed out when Lifetime canceled it after Season 2. Though there maybe hope yet. There is a massive campaign to get the show back and it seems to be making a lot of head way. Even William Shatner is Tweeting that it should not have been canceled. 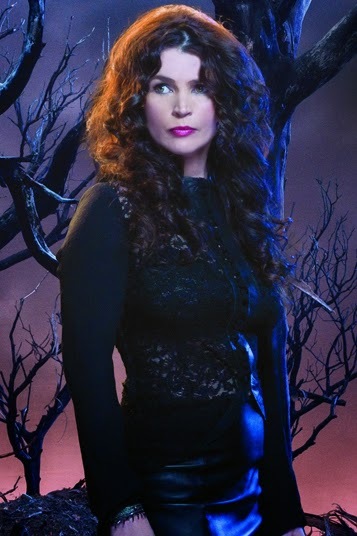 Checking on the #RenewWitchesOfEastEnd hashtag on Twitter it seems to be gaining more and more ground. My normal mode here is to use Classic Unisystem for books and Cinematic for TV shows. Well Witches of East End is both. For this posting I am going to focus soley on the TV show and do Cinematic Unisystem. This is mostly Buffy/Angel stats, but a lot of Ghosts of Albion added in since it is a better fit for the show. The Beauchamp witches are considered to be a supernatural race so they can choose some supernatural qualities and drawbacks normally denied to humans. Joanna is the matriarch of the Beachamp witches. She is sister to Wendy and mother to Ingrid and Freya. Joanna is over 1,000 years old and has been living on earth in exile. She tries to maintain a low profile when she can in order to keep her girls safe. Wendy is Joanna's younger sister. She is flighty and free spirited, but is fiercely devoted to her sister and nieces. Wendy and Joanna were estranged for while when Wendy accidentally killed one of Ingrid's incarnations. Ingrid is the oldest daughter. She has only discovered that she is in fact a witch. She spent most of her life as a rational skeptic. She has similar powers to her mother but can also write new spells. Ingrid currently works at the local East End library. She is also working on her dissertation on witches and witchcraft. Frey is the youngest and usually the first to fall in love. She is not as strong in her magic as her sister or mother, but has a special affinity for making potions. She is also the daughter that gets along the best with Aunt Wendy. Freya has calmed down a lot since her "wild child" days (which also makes her Wendy's favorite) to get married to a man named Dash. Though she falls in love with his brother, Killian. Both brothers are warlocks though. Freya currently works as a bartender. Personally I think they would work great in any Cinematic Unisystem game. I'd love to see more of this show (and so would the rest of the fans). If you feel so inclined, send a Tweet to @Lifetime with the hashtag #RenewWitchesOfEastEnd. I would consider is a personal favor. Also if you are so inclined then please check out this petition. I got the idea to re-watch this one from of the images used in the Krell Labs banners. But it has also been years since I have seen it and I have been wanting to watch it again. 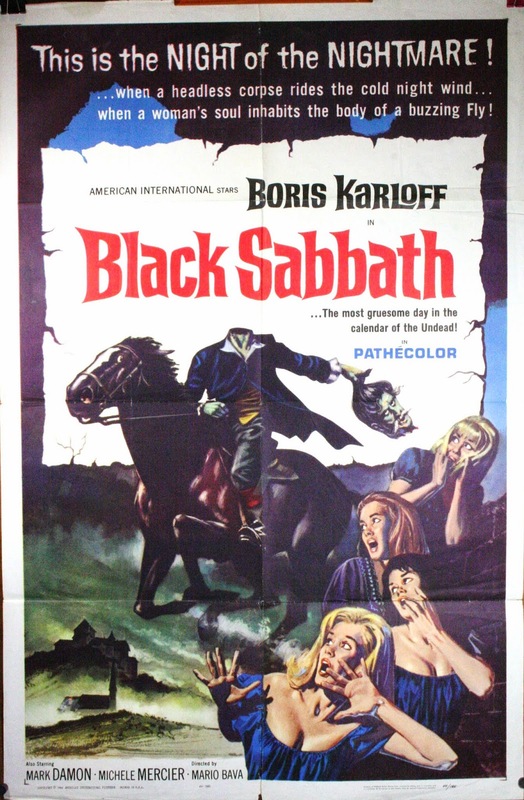 Black Sabbath is one of the landmark films of the horror genre. Also known as "I tre volti della paura" or the "Three Faces of Fear". It is a collection of three short stories with introductions by Boris Karloff. It was Boris Karloff that really scared me the most watching this a kid. In fact I think this is the movie that my dad showed me to introduce me to Boris Karloff. It also set the stage for other horror vignettes like Creepshow nearly 20 years later. To this day in fact that old woman in "The Drop of Water" still kinda freaks out. I also like the idea of treasure, in this case a ring, passing on a curse of fear to anyone that steals it. That will add some nasty excitement to your character's lives! "The Telephone" is also the one I remember the least. Though you can see the origins of many other movies, including Scream here. Everyday objects can sometimes be the most terrifying. "The Wurdalak" is one of the ones I remember the best. The sets for this one remind of the ones used in the Vampire Lovers, but not likely to be the same. The Wurdalak can cast shadows and reflect in mirrors. They are not active at sundown like other types of vampires, but wait till 10:00pm exactly. To kill the wurdalak one must use a dagger that has been in the monster's family for at least three generations. 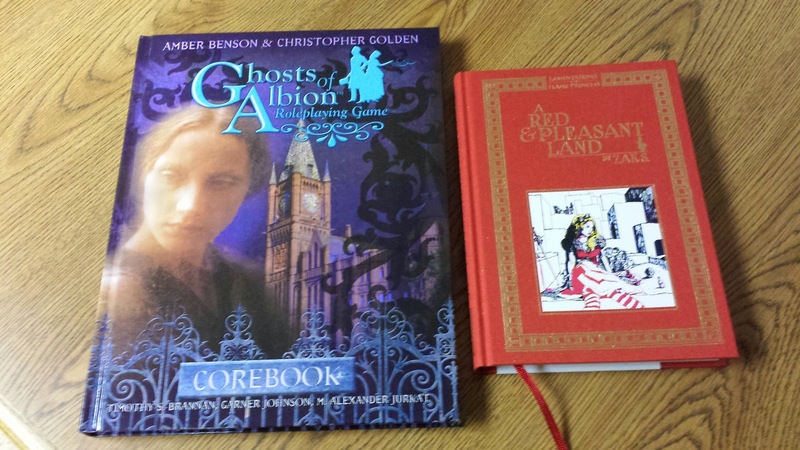 At home it is Ghosts of Albion. Yeah, I can't even get my own kids to play my game! Outside of that no one seems interested in any of the World of Darkness games. Ghosts of Albion is my baby. I will write other games, I might even write batter ones, but Ghosts was like nothing else. I also enjoy Buffy, Elric, Call of Cthlhu (that is sorta licensed), the various DC Comics RPGs and more. I'll also admit that d20 Star Wars is my favorite version of that game, but I like all versions of Star Trek. Note: This is something I did a while back and have been meaning to redo for old-school D&D. But this works well enough on it's own and I never could get it to jell just right for D&D games. One of the oldest forms of art is decorating the human body. Consequently one of the earliest forms of magic was decorating the human body to achieve supernatural effects. Whether to aid in battle or to connect more closely with the natural or supernatural world, body art and modification was amongst the first magics performed. A sorcerer, witch or magician usually learns their magic from learned masters, ancient tomes or some other supernatural agent. Magical tattoos are not that much different, but the ways of inscribing the magic is very different. Often words are not used as most magical tattoos pre-date written language; instead the secret language of symbols, shapes and often color is needed. Learning to inscribe a tattoo is a dying art. While once used the world over now only a handful the world over know the art. Directors then can rules that the Cast do not have access to the knowledge to learn how to make these and must seek out a Master. To inscribe a magical tattoo is much like casting a spell. To learn how to do it the Master must match or exceed in Success the power level of the tattoo to be learned. This is usually a Perception + Art + Occultism (not Magic) roll. To cast or inscribe the tattoo is a Willpower + Art + Magic roll. Like spells some tattoos have durations and some may be of limited use. Other may require a sacrifice of life force (Quality Points) or even Magic Levels to be able to use. Unlike spells magical tattoos are never quick-cast. Typically it takes 1 to 2 hours per Power Level to inscribe. Any interruptions render the tattoo useless. Effects: This powerful and rare tattoo is one of the most sought after all of magical tattoos. The application renders the recipient immune to magic. They are immune to any offensive spell below the Power Level of the tattoo (ie. a PL 3 tattoo protects against PL 1 or 2 spells). It can also negate up to PLx10 Life Point in damage per supernatural attack (say the fire breath of a demon). If the Ghosts of Albion magical combat rules are used then the PL of the tattoo is treated as the defenders level in Magic. They may not however attack back. The cost for this protection is high. The recipient also cannot be effected by any magic including healing from a spell or other beneficial supernatural effects (such as rapid healing). The recipient must also sacrifice 1 level of Magic (Sorcery) per PL of the Tattoo in order to gain its protection. The recipient of the tattoo can no longer cast magic themselves. Example: Eric the Witchhunter gets an anti-magic tattoo. He has 3 levels of Magic and finds a master that will give him a PL 3 Anti-Magic tattoo. He looses his 3 levels and nearly six hours later he has his tattoo. If he wishes to get a PL 4 Anti-Magic tattoo then he must first earn another level of Magic before he can do so. While he is doing so he can not of course even use them due to his own tattoo negating them. Effects: This special tattoo requires special woad paint found only in the British Isles and a master at applying the tattoos. Once inscribed the tattoo provides an armor value equal to the PL of the tattoo +1. The tattoo must be exposed and visible in order to provide this protection. Once active the tattoo is treated like thick hide or leather. Weapons, even bullets, seem to bounce off the user. They still suffer from environmental exposure however. A naked painted blue Celt might have enough protection to be bullet-proof, but will still freeze to death. A user may have multiple tattoos, but the protections are from the most powerful one (highest PL) only. Each additional tattoo regardless of PL provides only an extra +1 to the armor value. The tattoos, as the name implies, are permanent and only come into their magical effect when the user enters battle. The maximum protection in any combination is +6.